PT Saptaindra Sejati - PT SIS or known as "Saptaindra Sejati" is reputable coal mining company in Indonesia. PT SIS operates primarily as a mining and hauling contractors. PT SIS provides an integrated mining services, contract mining, civil works and infrastructure development, as well as logistical support to leading mining companies in Indonesia with international standard. PT Saptaindra Sejati is a mining services subsidiary company of PT Adaro Energy Tbk (ADARO Group), one of the largest public-listed mining groups in Indonesia. At present, PT Adaro Energy Tbk holds 100% ownership of Saptaindra Sejati’s shares. 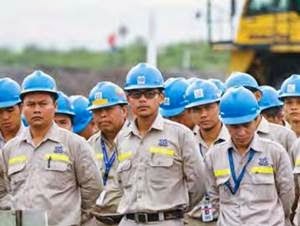 According to information found in PT Adaro Energy Tbk Annual Report 2016 as cited by JobsCDC,com, PT Saptaindra Sejati has more than 1,300 units of heavy equipment and directly employs 6,836 employees (as of December 2016). Strong academic results with GPA 2.75 ~ up. Willing to be relocated in all over SIS site project (Kalimantan Area). JobsCDC.com now available on android device. Download now on Google Play here. Please be aware of recruitment fraud. The entire stage of this selection process is free of charge. PT Saptaindra Sejati - Diploma Preparation Program Adaro Group March 2018 will never ask for fees or upfront payments for any purposes during the recruitment process such as transportation and accommodation.